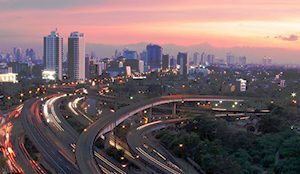 Despite of its chaotic, crowded, traffic congestion almost at any time of the day, professedly, Jakarta thriving in its infrastructure development and lifestyle. Sprawling around the city, almost every week you can find a new restaurant, clubs, bar opening. The astonishing skyscrapers architectures to amazing collection of malls, it is something that Jakartans can be proud of. Cattleya Park , resides at Jalan S. Parman, Tomang, West Jakarta. Enjoy the morning fresh air at this park. This is the nice place for jogging or if you need a quiet place to refresh your mind. With plenty of plants variety, and a lake in the middle of the city within the area of 3 hectares, Taman Cattleya serves as dedicated green area for West Jakarta. The inception of Jakarta was started in this part of city, compare to the current state as an urban metropolis city, it was once just a tiny area around 1,3 sq km. Stands as a reminder of the Indonesian history dominated by Dutch. Beside of its popular name nowadays as Old Batavia, it called Asia Jewel and Queen of The East. Old Batavia regarded as the trading central off Asia continent due to its strategic location and the abounding of natural resources. Take your time to stroll around the area, you will find yourself stepping back in time, surrounded with the old Dutch architectures. The center of old Batavia is Fatahillah Square, previously known as stadhuis (Town Hall), the structure of the building was built based on the design of Dam Palace Amsterdam, with a thick classical Baroque style of 17th Century. The office, court and underground jail was some of the section within this building. Old Batavia offers some museums you should not miss whilst you visit the area. 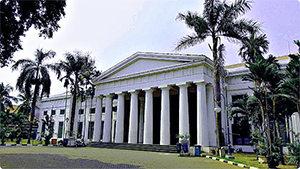 This museum displays the history of Jakarta development from pre-history to present, inaugurated on March 30, 1974 has become the center of conservation cultural properties which is related to city of Jakarta. Museum Wayang exhibits a large range of Javanese puppetry also collection of wayang from various places all over Indonesia and even from other countriesOn certain days. There is a performance of Wayang Golek, Wayang Kulit Betawi or Wayang kulit Purwa. 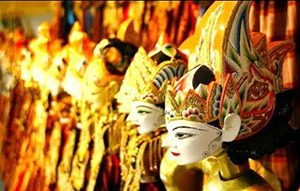 Indeed, it can be your unforgettable moment in Jakarta, you can learn Indonesia culture for more. Places to Visit in Jakarta, Indonesia. This museum was built in 1870. At the beginning the building was used as Dutch Judiciary Institution. Exhibit various kind of fine art of different techniques and materials. They also present Painting from many Indonesian famous painters. 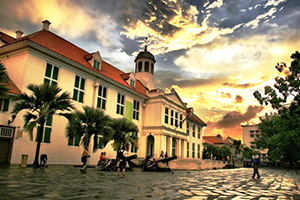 Dates back to 13th century, Sunda Kelapa harbor, an old port and trading place still standing until present day. It was a thriving trading port to ship the goods all over Indonesia and Asia. 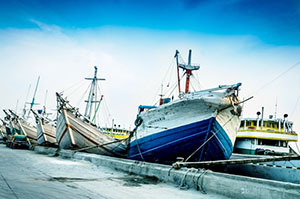 Sunda Kelapa also serve as the largest fish market in Jakarta from past time until now. The bustling Sunda Kelapa port has past, the remains of its past glorious time has over. Nowadays, you can come and admire the vibrant Phinisi boat by park along the coast, give the magnificent scene to contrast the dust and dull area of the port. They still have an important rule on transporting goods to all over Indonesia. What a great things to do in West Jakarta Indonesia! Pulau macan or Tiger Island, one of best weekend gateway in Jakarta. As one island amongst Thousand Island in Jakarta, it strives to live in harmony with nature.With only two hour boat rides from Ancol Marina. Spend your day at the white sandy beaches with the clear turquoise water. 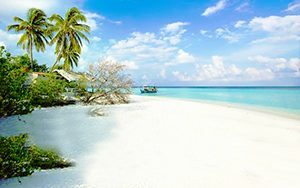 This tiny island with gorgeous and pristine environment, surely will captivate your heart. Snorkeling over the colorful reefs, or just lay down, basking yourself under the sun and enjoy your favorite cocktail. 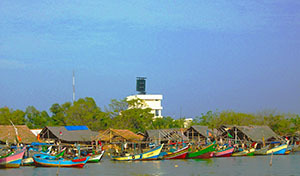 Tanjung Kait beach is a traditional fishing village situated in Tanggerang. People doesn’t come to Tanjung Kait Beach for swimming, more likely to watch the daily activities of the local fisherman. You will find traditional wooden house built above the water along the coastal. You will also find the traditional wooden port made of bamboos. Have a fresh seafood of the day, and they will cook it with traditional way too. Additionally, you can also rent a traditional boat and sail to the closest island. Pancar Mountain Nature Park situated in the Citeureup village, Bogor. You will find a beautiful pines forest upon entering the area. 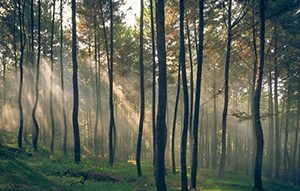 The sweet scented of pines trees will refresh you as well when you walk through the forest. Furthermore, this area is perfect for family picnic, mountain biking and camping. If you like to take collectable picture, you will have a panoramic scene for photography. Moreover, Camping at Gunung Pancar will give you an experience of getting closer with nature. Don’t worry, they provide the facilities to make you have a comfortable camping. Moreover, in the area of Pancar Mountain Nature park, there is Pancar natural hot spring water. For those who desire to soak in a hot spring, you can also visit the hot spring. Preferably to have a better facilities to soak, you can head to Tirta Arsanta or Giri Tirta hot spring water. 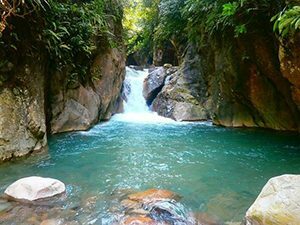 If you are looking for a weekend adventure , nevertheless not too far from West Jakarta, you can head to Curug Leuwi Hejo. It is pretty easy to reach from Jakarta with your own vehicles. Take Jagorawi toll road and take Sentul City exit. The exact location is at Kampung Wangan Cileungsi Desa Karang Tengah Babakan Madang, Sentul. From the parking area of Curug Leuwi Hejo, you will need to hike for around 15 minutes, go through the small path. Dress up yourself accordingly, make sure you use the hiking shoes or sandals. Bring extra cloth for change, whereas it will be hard for you to restrain yourself from having a deep in a clear emerald water. The small waterfall tucked away in a small forest, the water come from Cileungsi River. A huge park located in Cipanas Area, Cianjur Regency with the total area of 35 hectares. 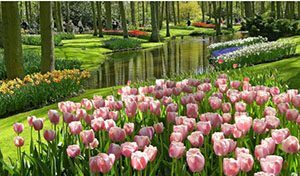 Taman Bunga Nusantara has a wide diversity of flowers from all over the world, it is not only tropical plant, they also grow plants from cold climate countries. A peacock shape flower will welcome every visitors at the entrance with various kind of colorful flower arranged on its tail. Amble around the garden and take a close look at each thematic garden within Taman Bunga Nusantara. Featuring water garden, French Garden, secret garden, Mediterranean garden, and Japanese garden. 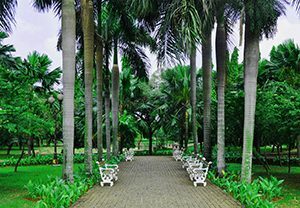 Elaborate supporting facilities such as green houses, lake geese, mini theater, gazebo, datto train are provided to make your visit become more comfortable and memorable things to do in West Jakarta Indonesia. Entrance Fee : 40,000 idr.